LOL...Well it's only Tuesday...lets enjoy the rest of the coming days with a new challenge. 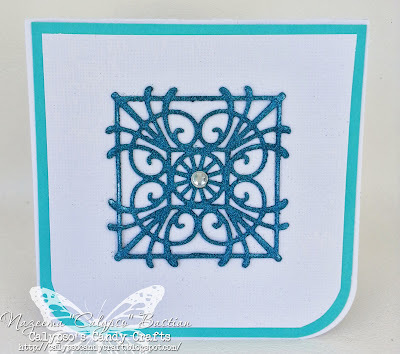 Have you seen the new SweetCut Dies from SweetStamps? OMG....Yes...OMG...They are amazing. I mean seriously. These dies cut so well and are so cute too!!! The SweetStamps Sweeties, are all doing the "Anything Goes" Challenge using and the SweetCut Dies. I promise you, you will want to see these creations. 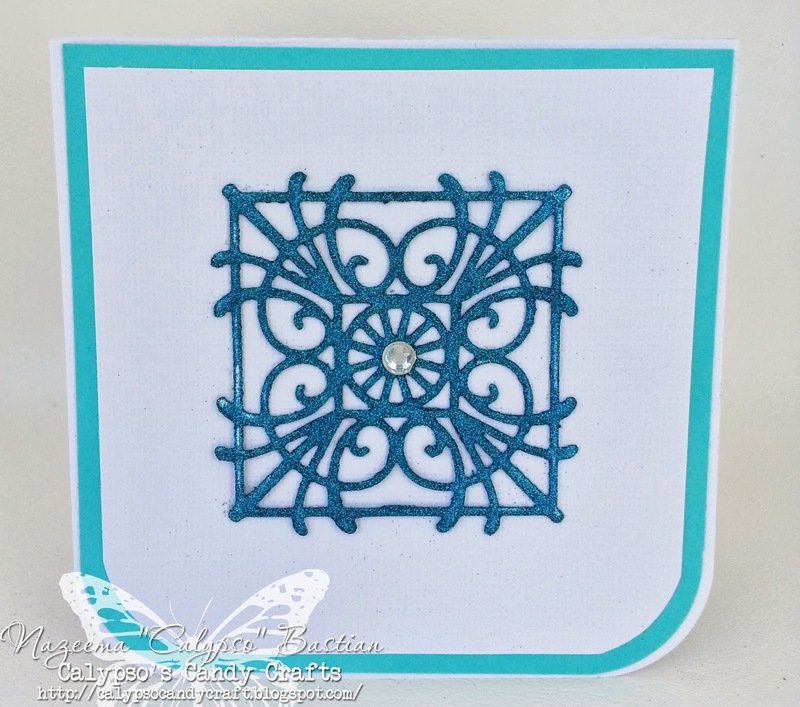 For my project sample today, I went clean and simple, using "Flourish Medallion"
I used my Silhouette to create my box. 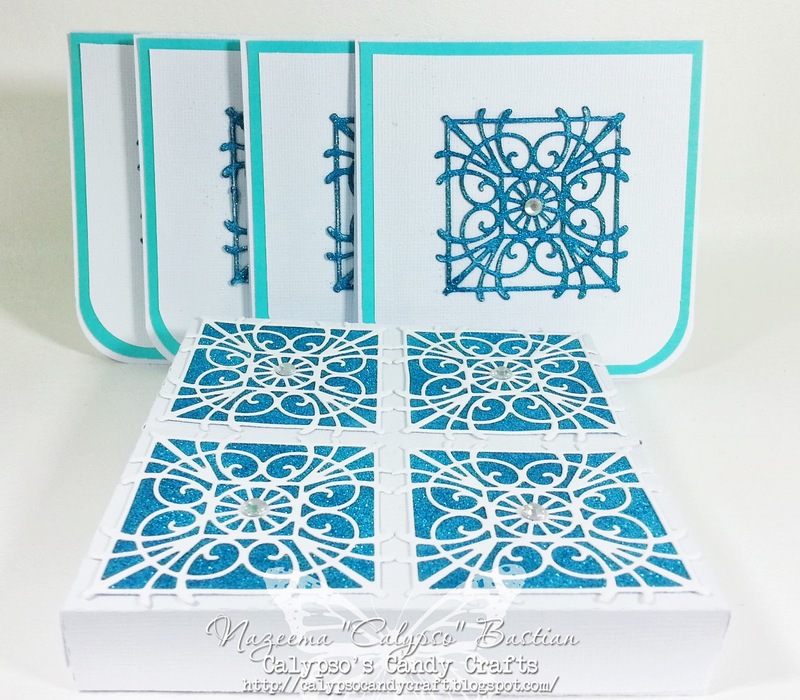 Using the "Flourish Medallion" die, I cut 8 pieces out of white cardstock. I cut 4 squares that would fit perfectly behind the medallions. I applied double adhesive tape and then applied my new and favorite glitter: Glitter Ritz: Peacock Blue. I then glue the cuts on top of the the glittered squares and applied to the top of the box, along with bling for the center. I also made 4- 4x4 mini cards, that fit perfectly inside the box. The centers of each card was created using the same glitter: Glitter Ritz: Peacock Blue, only this time it's been placed on the top of the die cut. It really pops and on the white background. You really don't want to miss the creations, created by the rest of the DT. They are really and truly amazing!!! What a lovely project! I must say these new Die's is fantastic!!! Awesome project! Very elegant design! Love your box lid- very pretty! And the note cards for the inside- gotta CASE them! Love the design of the box with the dies and wonderful idea to fill it with matching cards. Card and box both look wonderful! These are gorgeous! I love their CAS design and the shimmer on here, plus that box is awesome!